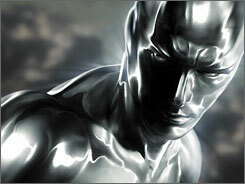 Here's the first look at the Silver Surfer from next year's Fantastic Four: The Rise of the Silver Surfer. It appeared first in USA Today, so check there for a larger image. Looks pretty good if you ask me. Very silver and lots of emotion in the face, which is a hard thing to pull off, given that the Surfer's face is practically featureless. I expect the trailer to hit the 'net anytime today, since it can be seen with Night at the Museum that was also released today.